Pucker up! It’s National Kissing Day, so if you’re still on a high from Fourth of July fireworks, there’s no need to let the flame sizzle. In honor of International Kissing Day, our friends at online dating site Match have partnered up with Colour Pop with a “Kiss + Tell” Survey, which showed that 84% of singles really enjoy kissing, with most experiencing their first kiss between the age of 13 – 16. The TOP 3 spots to be kissed? How long is the perfect kiss? 20 % of singles agreed that 10 seconds is the amount of time for the ideal kiss. 70% of singles say BAD BREATH has definitely ruined a kiss. 70% of singles say a bad first kiss is NOT a deal breaker. The second most romantic place to be kissed is on the neck. Nearly 1/3 (30%) of single women say they’ve actually had more success landing a first kiss while wearing lipstick! Nearly 1/3 (30%) of single men say a great make out is when they have a woman’s lipstick on their face. 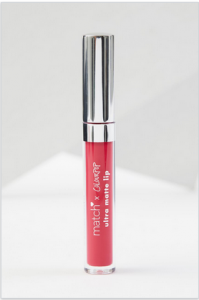 In honor of National Kissing Day, Match and Colour Pop created limited edition lipstick, Mwah, a raspberry red ultra-matte lipstick, plus $1 of each lipstick purchased will be donated to GLAM4GOOD Foundation, for only $6.